Click the button below to add the 6,000-Watt Direct Mount Racking System (Standing Seam) to your wish list. 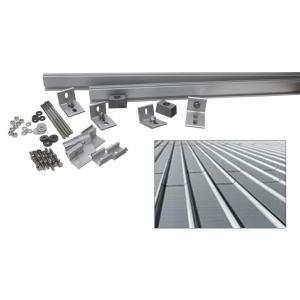 The 6,000-Watt Direct Mount Racking System (Standing seam) is ideal for installation on Standing seam sloped roofs. This low profile racking system is built from aluminum and stainless steel for years of all-weather service. The finished array stands just high enough above the roof to allow air flow below the panels. The included hardware allows for easy installation on standing seam roofs. Required roof space: 435 sq. ft.